Leading Manufacturer of ss roasting machine, industrial roasting machine, portable coffee roaster, coffee roasters, coffee bean roaster machinery and coffee roaster machines from Coimbatore. With an aim to stand tall on the expectations of patrons, we are engaged in offering premium quality SS Roasting Machine. Offered by us, these roasting machines built with stainless steel are used for roasting of raw coffee seeds by removing husk over seeds and smoking them as well as precision following of other involved processes so as to ensure high efficiency in involved processes. 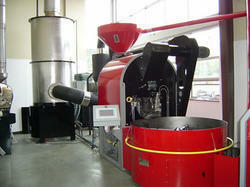 We have designed theses roasters in curtain way that ensures noiseless and vibration free working. We are backed by our profound experience in the domain, we offer our clients with comprehensive range of Industrial Roasting Machine. Manufactured by using latest technology, these industrial roasting machine offers efficient functioning in low power consumption with optimum performance. 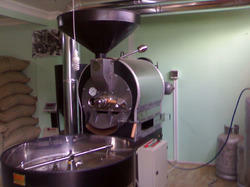 Our roasting machine are very easy in handling during the process of coffee seeds roasting. Through process of roasting seeds involves removal of husk, smoking of the seeds, followed by other necessary processes. Controls : Electrical and Electronic for Temperature Cut 'off'. We are glad to introduce our self as a reputed manufacturer and supplier of an incredible array best quality . Offered by us, these roasting machines are produced using high-grade raw materials such as mild steel, stainless steel and similar other materials . 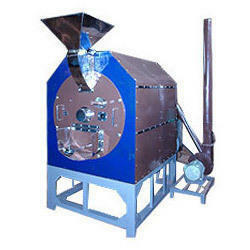 Our range of Roasting machine comprises of products such as Portable Coffee Roaster. This machine is used for roasting pea nuts, ground nuts, cashew nuts and coffee seeds.